The comparisons between Saucony’s latest iteration of the Peregrine lineup and its namesake bird-of-prey are striking. The peregrine falcon (Falco peregrinus) is a widespread raptor that is renowned for its speed and hunting lethality. Reaching over 320 km/h (200 mph) during its characteristic high-speed dive it is the fastest member of the animal kingdom. 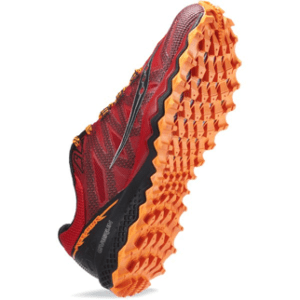 The responsive 4mm stack height and the 266g-weight keeps Saucony’s Peregrine competitive in a class of mid-level trail shoes – but it is the conspicuous PWRTRAC outsole design that allows the ambitious trail runner the ability to descend at speeds the competition can only dream of. The Peregrine often hunts at dawn and dusk when their quarry is most active; many running events take place at these same hours. The wearer of the Peregrine can take down their competition in the wee hours of the day. Peregrines require open spaces away from urban areas searching for prey. How many trail runners do you know that like to run in the city? Saucony’s metaphor for this Falcon employs a newly added EVERUN top sole. This gives a delicate balance between response and cushion, with the RUNDRY collar keeping the heel cosy and secure for extended hunting, I mean, running excursions. Once it spots the prey, the peregrine falcon begins its stoop (descent), folding back the tail and wings, with feet tucked. The Peregrine Falcon strikes its prey with a clenched foot, stunning or killing it with the impact, then turns to catch it in mid-air. 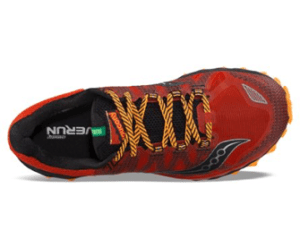 The foot is clearly the vehicle that trail runners use to vanquish their victims, with Saucony’s Peregrine doing an admirable job of both protecting this tool and enabling it to be used to lethal effect in a running event. I would give the Peregrine shoe 4 out of 5 stars, due to its distinctive sole construction and comfortable fit. The peregrine falcon, naturally, gets 5 out of 5 stars for being the fastest bird in the sky. Runners should consider this shoe if they fancy themselves descending specialists. The low heel pitch, secure top-line collar, and ‘talon-like’ PWRTRAC outsole pattern gives considerable security and responsiveness running down a mountain. Our product reviews help you find the right fit for you. Get caught up on everything you need to know about shoes!